Save some gas and leave the driving to us … hop aboard our free Trolley Service! Visit a restaurant, do a little shopping, transfer to the Municipal Trolley and spend a day in Lake George Village … and never worry about finding parking or feeding the meter! Since 1978, Lake George RV Park has provided complimentary transportation services for our guests. The Trolley Service operates daily during our summer season (June 29th-Sept 1st). It’s also available on Saturdays only from May 25th through June 22nd and from September 7th through October 12th (including Sun., May 26th & Sun., Oct. 13th). Our trolleys will also make one Out-of-Park stop to nearby shops and restaurants. This stop is conveniently located in the center of over 100 outlet stores and restaurants, one of Lake George, NY’s biggest attractions. 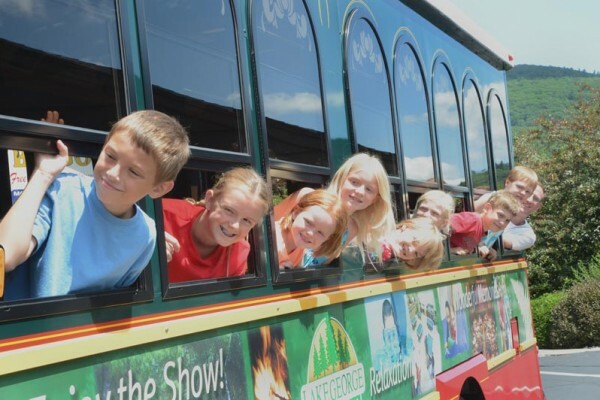 From the Outlet Center, guests may connect with a Municipal Trolley that will shuttle them to other local area attractions such as The Great Escape Amusement Park, Lake George Village and the City of Glens Falls for a nominal fee. Transportation to the Village of Lake George is also available during our Summer Season. You can find more information regarding trolley service to the Village of Lake George here. This is just one more way our resort offers more services, on-site amenities and charm than hotels and other lodging options in the Lake George area. For questions or comments, contact us online or call us at 518-792-3775. We look forward to seeing you!